What constitutes “safe” drinking water? For more than a century, the US government has attempted to answer this question by setting national standards for drinking water quality. In a federal system of governance, however, national standards only go so far. State and local governments have long considered it their prerogative to select water supplies and treatment technologies – decisions that largely determine whether or not national standards will ever be met. Tragedies like the drinking water crisis in Flint, MI remind us that there are definite limits to what federal power can achieve. Nevertheless, the quest to raise the quality of drinking water through national standards remains an important and underappreciated episode in the history of US public health policy. 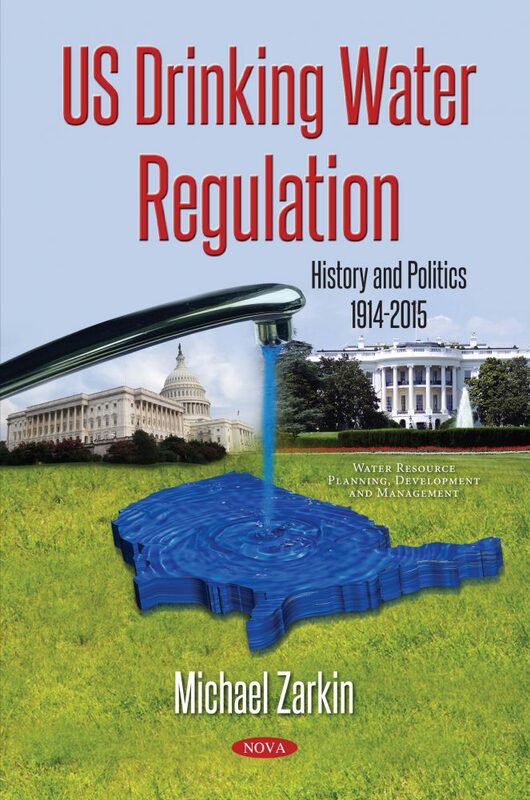 In this book, Michael Zarkin traces the development of US drinking water standards, beginning with the earliest efforts by the US Public Health Service to craft national standards, and ending with the EPA’s most recent efforts to implement the Safe Drinking Water Act. Along the way, Dr. Zarkin tells the story of the ideas, political battles, and scientific controversies that shaped our nation’s drinking water regulations. In the end, Dr. Zarkin concludes that drinking water regulation is made through an unconventional style of politics not found in other areas of US environmental policy. Altman, L. K. (1993, April 20). Outbreak of disease in Milwaukee undercuts confidence in water. The New York Times, p. C3. Andrews, R. N. L. (1999). Managing the environment, managing ourselves: A history of American environmental policy. New Haven: Yale University Press. Announcement of the Draft Drinking Water Contaminant Candidate List, 62 Fed. Reg. 52104 (1997). Announcement of the Draft Drinking Water Contaminant Candidate List, 63 Fed. Reg. 10274 (1998). Announcement of Preliminary Regulatory Determinations for the Contaminants on the Third Drinking Water Contaminant Candidate List, 79 Fed. Reg. 62716 (2014). Announcement of Preliminary Regulatory Determinations for the Priority Contaminants on the Drinking Water Contaminant Candidate List, 67 Fed. Reg. 38222 (2002). Announcement of Regulatory Determinations for the Priority Contaminants on the Drinking Water Contaminant Candidate List, 68 Fed. Reg. 42898 (2003). Anton, T. J. (1989). American federalism and public policy: How the system works. New York: Random House. Baker, M. N. (1948). The quest for pure water: The history of water purification from the earliest records to the twentieth century. New York: American Water Works Association. Baumgartner, F. R. & Jones, B. D. (2009). Agendas and instability in American politics (2nd ed.). Chicago: University of Chicago Press. Birkland, T. A. (1997). After disaster: Agenda setting, public policy, and focusing events. Washington, D.C.: Georgetown University Press. Bosso, C. J. (1987). Pesticides and politics: The life cycle of a public issue. Pittsburgh: University of Pittsburgh Press. Bosso, C. J. (1988). Transforming adversaries into collaborators: Interest groups and the regulation of chemical pesticides. Policy Sciences, 21, 3-22. Bosso, C. J. (2005). Environment, Inc.: From grassroots to beltway. Lawrence: University Press of Kansas. Brown, A. E. (1987). The politics of airline deregulation. Knoxville: University of Tennessee Press. Bryner, G. C. (1987). Bureaucratic discretion: Law and policy in federal regulatory agencies. New York: Pergamon Press. Bryner, G. C. (1995). Blue skies, green politics: The Clean Air Act of 1990 and its implementation (2nd ed.). Washington, DC: Congressional Quarterly Press. Cahn, M. A. (1995). Environmental deceptions: The tension between liberalism and environmental policymaking in the United States. Stony Brook: State University of New York Press. Carpenter, D. P. (2001). The forging of bureaucratic autonomy: Reputations, networks, and policy innovation in executive agencies, 1862-1928. Princeton: Princeton University Press. Control of Organic Chemical Contaminants in Drinking Water, 43 Fed. Reg. 5756 (1978). Cook, B. J. (1988). Bureaucratic politics and regulatory reform: The EPA and emissions trading. New York: Praeger. Cosgrove, J. J. (1909). History of sanitation. Pittsburgh: Standard Sanitary Manufacturing Company. Derthick, M. & Quirk, P. J. (1985). The politics of deregulation. Washington, DC: Brookings Institution. Drinking Water Contaminant Candidate List 2 – Notice, 69 Fed. Reg. 17406 (2004). Drinking Water Contaminant Candidate List 2 – Final Notice, 70 Fed. Reg. 9071 (2005). Drinking Water Contaminant Candidate List 3 – Draft, 73 Fed. Reg. 9628 (2008). Drinking Water Contaminant Candidate List 3 – Final, 74 Fed. Reg. 51850 (2009). Drinking Water Contaminant Candidate List 4 – Draft, 80 Fed. Reg. 6076 (2015). Dryzek, J. S. (2005). The politics of the earth: Environmental discourses (2nd ed.). New York: Oxford University Press. Eisner, M. A. (2000). Regulatory politics in transition (2nd ed.). Baltimore: Johns Hopkins University Press. Ellms, J. W. (1917). Water purification. New York: McGraw-Hill. Federal Safe Drinking Water Act – Oversight: Hearing before the Subcommittee on Health and the Environment of the Committee on Interstate and Foreign Commerce, House of Representatives, 95th Cong. 1 (1978). Fiorino, D. J. (1990). Can problems shape priorities? : The case of risk-based environmental planning. Public Administration Review, 50, 82-90. Fiorino, D. J. (2001). Environmental policy as learning: A new view of an old landscape. Public Administration Review, 61, 322-334. Flint Water Advisory Task Force. (2016). Final report. Retrieved from: https://www.michigan.gov/documents/snyder/FWATF_FINAL_REPORT_21March2016_517805_7.pdf. Gonzalez, G. A. (2001). Corporate power and the environment: The political economy of US environmental policy. Washington, DC: Rowman and Littlefield. Gormley, W. T. (1986). Regulatory issue networks in a federal system. Polity, 18, 595-620. Graham, D. A. (2016, January). What did the governor know about Flint’s water, and when did he know it? The Atlantic. Retrieved from: https://www.theatlantic.com/politics/archive/2016/01/what-did-the-governor-know-about-flints-water-and-when-did-he-know-it/423342/. Green, M. J. (Ed.) (1973). The monopoly makers: Ralph Nader’s study group report on regulation and competition. New York: Grossman. Habicht II, F. H. (1994). EPA’s vision for setting national environmental priorities. In A.M. Finkel & D. Golding (Eds. ), Worst things first: The debate over risk-based national environmental priorities (pp. 33-46). Washington, DC: Resources for the Future. Hajer, M. (1995). The politics of environmental discourse: Ecological modernization and the policy process. Oxford: Oxford University Press. Harden, V. A. (1986). Inventing the NIH: Federal biomedical research policy, 1887-1937. Baltimore: Johns Hopkins University Press. Harris, R. A. & Milkis, S. M. (1996). The politics of regulatory change: A tale of two agencies (2nd ed.). New York: Oxford University Press. Hazen, A. (1900). The filtration of public water supplies (3rd ed.). New York: Wiley and Sons. Hazen, A. (1914). Clean water and how to get it (2nd ed.). New York: Wiley and Sons. Hoornbeek, J. A. (2011). Water pollution policies and the American states: Runaway bureaucracies or congressional control? Albany, NY: State University of New York Press. Hopkins, O. C. (1961). Attitude of US Public Health Service in development of drinking water standards, 1961. Journal of the American Water Works Association, 53, 946-950. Horwitz, R. B. (1989). The irony of regulatory reform: The deregulation of American telecommunications. New York: Oxford University Press. Jasanoff, S. (1990). The fifth branch: Science advisors as policymakers. Cambridge, MA: Harvard University Press. Jennings, C. A. (1923). The disinfection of public water supplies and its relation to public health. Journal of the American Water Works Association, 10, 127-138. Jochim, A. E. & May, P. J. (2010). Beyond subsystems: Policy regimes and governance. Policy Studies Journal, 38, 303-327. Johnson, G. A. (1914). Present day water filtration practice. Journal of the American Water Works Association, 1, 31-80. Jones, C. O. (1974). Speculative augmentation in federal air pollution policymaking. Journal of Politics, 36, 438-464. Kamieniecki, S. (2006). Corporate America and environmental policy: How often does business get its way? Palo Alto: Stanford University Press. Ketcham-Colwill, J. (1986). Safe drinking water law toughened. Environment, 28(7), 5, 42-43. Kimm, V. J., Kuzmack, A. M. & Schnare. D. W. (1981). Waterborne carcinogens: A regulator’s view. In R.W. Crandall & L.B. Lave (Eds. ), The scientific basis of health and safety regulation (pp. 229-249). Washington, DC: Brookings Institution. Kirkwood, J. P. (1869). Report on the filtration of river waters for the supply of cities as practiced in Europe. New York: Van Nostrand. Klyza, C. M. (1992). A window of autonomy: State autonomy and the Forest Service in the early 1990s. Polity, 25, 173-196. Klyza, C. M. (1996). Who controls public lands? : Mining, forestry, and grazing policies, 1870-1990. Chapel Hill: University of North Carolina Press. Klyza, C. M. & Sousa, D. (2008). American environmental policy, 1990-2006: Beyond gridlock. Cambridge, MA: MIT Press. Kotin, P. & Hueper, W. C. (1955). Relationship of industrial carcinogens to cancer in the general population. Public Health Reports, 70, 331-333. Kraft, M. E. & Kamieniecki, S. (Eds.). (2007). Business and environmental policy: Corporate interests in the American political system. Cambridge, MA: MIT Press. Lead Contamination Control Act, P.L. 100-572, October 31st, 1988. Lead contamination: Hearings before the Subcommittee on Health and Environment of the Committee on Energy and Commerce, House, 100th Cong. 1 (1988). Lijphart, A. (1971). Comparative politics and the comparative method. American Political Science Review, 65, 682-693. Marx, J. (1974). Drinking water: Another source of cancer? Science, 186(4166), 809-811. Matukaitis, J. M. (1997). The emerging recognition of Cryptosporidium as a health hazard. Journal of Community Health Nursing, 14(3), 135-140. McCraw, T. K. (1985). Prophets of regulation. Cambridge, MA: Belknap Press. McDermott, J. H. (1973). Federal drinking water standards: Past, present, and future. Journal of the Environmental Engineering Division—ASCE, EE4, 469-478. McLaughlin, A. J. (1914). What is safe drinking water? Public Health Reports, 26, 1686-1694. Merrill, R. A. (1997). Food safety regulation: Reforming the Delaney clause. Annual Review of Public Health, 18, 313-340. Milazzo, P. C. (2006). Unlikely environmentalists: Congress and the Clean Water Act, 1945-1972. Lawrence, KS: University Press of Kansas. Moe, T. M. (1989). The politics of bureaucratic structure. In J.E. Chubb & P.E. Peterson (Eds. ), Can the government govern? (pp. 267-329). Washington, D.C.: Brookings Institution. National Drinking Water Advisory Council. (2004). Report on the CCL classification process to the US Environmental Protection Agency. Washington, D.C.: National Drinking Water Advisory Council. National Interim Primary Drinking Water Regulations: Trihalomethanes, 48 Fed. Reg. 8406 (1983). National Interim Primary Drinking Water Standards, 40 Fed. Reg. 59566 (1975). National Research Council. (1977). Drinking water and health (vol. 1). Washington, DC: National Academies Press. National Research Council. (1999). Setting priorities for drinking water contaminants. Washington, D.C.: National Academies Press. National Research Council. (2001). Classifying drinking water contaminants for regulatory consideration. Washington, D.C.: National Academies Press. Organic Chemical Contaminants: Control Options in Drinking Water, 41 Fed. Reg, 28991 (1976). Oversight Hearing on the Environmental Protection Agency’s implementation of the Safe Drinking Water Act’s Unregulated Drinking Water Contaminant Program: Hearing before the Committee on Environment and Public Works, Senate, 112th Cong. (2011). (Testimony of Robert Perciasepe). Retrieved at http://www.epw. senate.gov/public/index.cfm/2011/7/full-committee-hearing-entitled-oversight-hearing-on-the-environmental-protection-agencys-implementation-of-the-safe-drinking-water-acts-unregulated-drinking-water-contaminants-program. Page, T., Harris, R. H. & Epstein, S. S. (1976). Drinking water and cancer mortality in Louisiana. Science, 193(4247), 55-57. Pontius, F. W. (1993). Protecting the public against Cryptosporidium. Journal of the American Water Works Association, 85(8), 18, 22, 122-123. Pontius, F. W. (2003). History of the Safe Drinking Water Act. In F.W. Pontius (Ed.) Drinking water regulation and health (pp. 71-103). New York: Wiley-Interscience. Potable waters: Hearing before the Committee on Commerce, Senate, 92nd Cong. 1 (1972). Regulatory Determinations Regarding Contaminants on the Second Drinking Water Contaminant Candidate List – Preliminary Determinations, 72 Fed. Reg. 24016 (2007). Regulatory Determinations Regarding Contaminants on the Second Drinking Water Contaminant Candidate List, 73 Fed. Reg. 44251 (2008). Request for Nominations of Drinking Water Contaminants for the Fourth Contaminant Candidate List, 77 Fed. Reg. 27057 (2012). Rosenbaum, W.A. (2014). Environmental politics and policy (9th ed.). Washington, DC: Congressional Quarterly Press. Ruckleshaus, W.D. (1985). Risk, science, and democracy. Issues in Science and Technology, 1 (3), 19-38. Russell, C.S. (Ed.). (1978). Safe drinking water: Current and future problems. Washington, DC: Resources for the Future. Safe drinking water: Hearing before the Subcommittee on Public Health and Environment of the Committee on Interstate and Foreign Commerce, House of Representatives, 92nd Cong. 1 (1971). Safe drinking water: Hearing before the Subcommittee on Toxic Substances and Environmental Oversight of the Committee on Environment and Public Works, Senate, 97th Cong. 1 (1982). Safe Drinking Water Act of 1973: Hearing before the Subcommittee on Environment of the Committee on Commerce, Senate, 93rd Cong. 1 (1973). Safe Drinking Water Act of 1974, P.L. 93-523, December 16th, 1974. Safe Drinking Water Act Amendments: Hearing before the Subcommittee on Health and the Environment of the Committee on Interstate and Foreign Commerce, House, 95th Cong. 1 (1977). Safe Drinking Water Act Amendments of 1986, P.L. 99-339, June 19th, 1986. Safe Drinking Water Act Amendments of 1993: Hearing before the Committee on Environment and Public Works, Senate, 103rd Cong. 1 (1993). Safe Drinking Water Act Amendments of 1996, P.L. 104-182, August 6th, 1996. Safe Drinking Water Act oversight: Hearing before the Subcommittee on Environmental Pollution of the Committee on Environment and Public Works, Senate, 95th Cong. 1 (1978). Safe Drinking Water Amendments of 1985: Hearing before the Subcommittee on Toxic Substances and Environmental Oversight of the Committee on Environment and Public Works, Senate, 99th Cong. 1 (1985). Sedgwick, W. T. (1902). Principles of sanitary science and the public health. New York: Macmillan. Sellers, C. (1997). Discovering environmental cancer: Wilhelm Hueper, post-World War II Epidemiology, and the vanishing clinician’s eye. American Journal of Public Health, 87, 1824-1835. Skocpol, T. (1985). Bringing the state back in: Strategies of analysis in current research. In P.B. Evans, D. Rueschemeyer, & T. Skocpol (Eds. ), Bringing the state back in (pp. 3-43). Cambridge, UK: Cambridge University Press. Skowronek, S. (1982). Building a new American state: The expansion of national administrative capacities, 1877-1920. Cambridge, UK: Cambridge University Press. Stockington, H. E. & Woodward, R. L. (1958). Toxicologic methods for establishing drinking water standards. Journal of the American Water Works Association, 50, 515-529. Swift, E. K. & Brady, D. W. (1994). Common ground: History and theories of American politics. In L.C. Dodd & C. Jillson (Eds. ), The dynamics of American politics (pp. 83-104). Boulder, CO: Westview Press. Tarlock, A. D. (1997). Safe drinking water: A federalism perspective. William and Mary Environmental Law and Policy Review, 21, 233-263. Tarr, J., Curley, J., McMichael, F. C. & Yosie, T. (1984). Water and wastes: A retrospective assessment of wastewater technology in the United States, 1800-1932. Technology and Culture, 25, 226-263. U.S. Environmental Protection Agency. (1972). Industrial pollution of the lower Mississippi River in Louisiana. Dallas: Region VI Surveillance and Analysis Division. U.S. Environmental Protection Agency. (1986). Reducing lead in drinking water: A benefit analysis. Washington, DC: Office of Policy, Planning, and Evaluation. U.S. Environmental Protection Agency. (1987). Unfinished business: A comparative assessment of environmental problems. Washington, DC: Office of Policy, Planning, and Evaluation. U.S. Environmental Protection Agency. (1990). Reducing risk: Setting priorities and strategies for environmental protection. Washington, DC: Science Advisory Board, Relative Risk Reduction Strategies Committee. U.S. Environmental Protection Agency. (1993). Administration recommendations for Safe Drinking Water Act reauthorization. Washington, DC: Office of Water. U.S. Environmental Protection Agency. (1995). Strengthening the safety of our drinking water: A report on progress and challenges and an agenda for action. Washington, DC: Office of Water. U.S. Environmental Protection Agency. (1996). The conceptual approach for contaminant identification. Washington, D.C.: Office of Water. U.S. Environmental Protection Agency. (2009). SAB advisory on EPA’s draft third contaminant candidate list. Washington, D.C.: Science Advisory Board, Drinking Water Committee. U.S. General Accounting Office. (1973). Improved federal and state programs needed to insure the purity and safety of drinking water in the United States. Washington, DC: U.S. General Accounting Office. U.S. General Accounting Office. (1982). States’ compliance lacking in meeting safe drinking water regulations. Washington, DC: U.S. General Accounting Office. U.S. General Accounting Office. (1990a). Drinking water: Compliance problems undermine EPA program as new challenges emerge. Washington, DC: U.S. General Accounting Office. U.S. General Accounting Office. (1990b). Toxic substances: Effectiveness of unreasonable risk standards unclear. Washington, DC: U.S. General Accounting Office. U.S. General Accounting Office. (1992). Drinking water: Widening gap between needs and available resources threatens vital EPA program. Washington, DC: U.S. General Accounting Office. U.S. General Accounting Office. (1993). Drinking water: States face increased difficulties in meeting basic requirements. Washington, DC: U.S. General Accounting Office. U.S. Government Accountability Office. (2011). EPA should improve implementation of requirements on whether to regulate additional contaminants. Washington, D.C.: U.S. General Accounting Office. U.S. Public Health Service. (1914). Bacteriological standard for drinking water: The standard adopted by the Treasury Department for drinking water supplied to the public by common carriers in interstate commerce. Public Health Reports, 29, 2959-2966. U.S. Public Health Service. (1922). The U.S. Public Health Service Advisory Committee on Official Water Standards. Public Health Reports, 37, 1466-1469. U.S. Public Health Service. (1925). Report of the Advisory Committee on Official Water Standards. Public Health Reports, 40, 693-722. U.S. Public Health Service. (1943a). Public Health Service drinking water standards. Public Health Reports, 58, 69-82. U.S. Public Health Service. (1943b). Manual of recommended water sanitation practice. Public Health Reports, 58, 83-111. U.S. Public Health Service. (1946). Public health drinking water standards, 1946. Public Health Reports, 61, 371-384. U.S. Public Health Service. (1961). Drinking water standards, 1961. Journal of the American Water Works Association, 53, 935-945. U.S. Public Health Service. (1962). Drinking water standards. PHS publication #956. Washington, DC: Government Printing Office. U.S. Public Health Service. (1970). Community water supply study: Analysis of national findings. Washington, DC: Bureau of Water Hygiene. U.S. Treasury Department. (1903). Quarantine laws and regulations of the United States. Washington, DC: Government Printing Office. U.S. Treasury Department. (1909). Annual report of the Surgeon General of the Public Health and Marine Hospital Service of the United States. Washington, DC: Government Printing Office. Weidenbaum, M. L. (1978). On estimating regulatory costs. Regulation, 2(3), 14-17. Weir, M. (1992). Politics and jobs: The boundaries of employment policy in the United States. Princeton: Princeton University Press. Weir, M. & Skocpol, T. (1985). State structures and the possibilities for “Keynesian” responses to the Great Depression in Sweden, Britain, and the United States. In P.B. Evans, D. Rueschesmeyer, & T. Skocpol (Eds), Bringing the state back in (pp. 107-168). Cambridge, UK: Cambridge University Press. Weiss, C. (2007). Defining precaution. Environment, 49(8), 33-36. Whipple, G. C. (1908). Typhoid fever: Its causation, transmission, and prevention. New York: Wiley and Sons. Williams, B. A. & Matheny, A. R. (1995). Democracy, dialogues, and environmental disputes: The contested languages of social regulation. New Haven: Yale University Press. Williams, R. C. (1951). The United States Public Health Service, 1798-1950. Washington, DC: Commissioned Officers Association of the United States Public Health Service. Wilson, J. Q. (1974). Political organizations. New York: Basic Books. Wolman, A. (1960). Concepts of policy in the formulation of so-called standards for health and safety. Journal of the American Water Works Association, 52, 1343-1348. Zarkin, M. (2003). Social learning and the history of US telecommunications policy, 1900-1996. Lewiston, NY: Edwin Mellen Press. Zarkin, M. (2015). Unconventional pollution control politics: The reformation of the US Safe Drinking Water Act. Electronic Green Journal, 1(38). Retrieved from www.escholarship.org/uc/search?entity =uclalib_egj;volume=1;issue=38. Zarkin, M. (2017). Policy learning mechanisms and the regulation of US drinking water. Public Organization Review, 17, 275-291. Audience: Scholars of US environmental and public health studies (policy and history).